Animal Wildlife | Discus | The discus is a species of tropical cichlid, found in the Amazon basin of South America. There are three recognised sub-species of the discus which are the green discus, the blue discus and the brown discus. The discus was first described by Dr. Heckel in 1840 and despite variations in colour, all are similar in appearance but are found in different geographic locations. 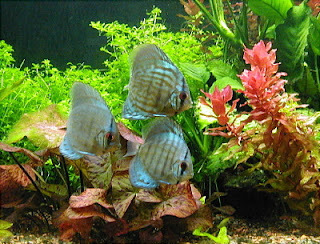 There is however some disagreement over the scientific names for each species, but many agree that most captive bred discus are thought to have originated from these three sub-species. The discus is a medium sized fish, with a round, flattened body and large extended fins which also add to it's disk-like shape (from which it get it's name). 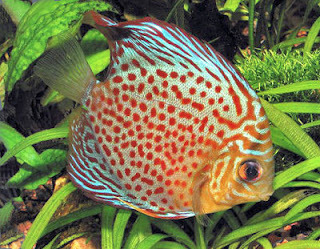 Discus have small mouths and small bright red eyes, and vary in colour depending on the species (either green, blue or brown in the wild, but there are many new variations found in aquariums around the world today such as red). The round body of the discus also has nine dark, vertical stripes which are thought to be used both for camouflage (along with it's colour and flattened body) and to communicate within the school. The discus is one of only a few cichlid species found outside of Africa. They are found inhabiting sections of deep, calm, well-wooded waters in the Amazon Basin and it's tributaries. These slow-moving rivers and backwaters of the Amazon river system that stretch through Brazil, Columbia and Peru, provide the perfect habitat for these large fish, which generally shelter amongst the submerged roots and branches. 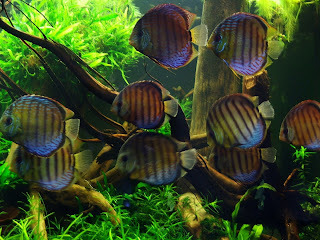 Discus are known to be fussy about the water conditions in artificial habitats and are not for the inexperienced keeper. In their natural environment, discus inhabit soft, acidic, and very warm waters, where there is less competition from other fish. Discus form pair bonds when they are about 75% of their adult size and these pairs tend to remain together for life. They choose a nearly vertical spawning site, which is then cleaned in preparation for the female to lay between 80 and 400 eggs. The male then fertilises them and both parents help to guard their eggs until they hatch. Like other cichlids, discus parents care for their young well and even secrete a slimy substance through their scales for their fry to feed off for the first couple of weeks. 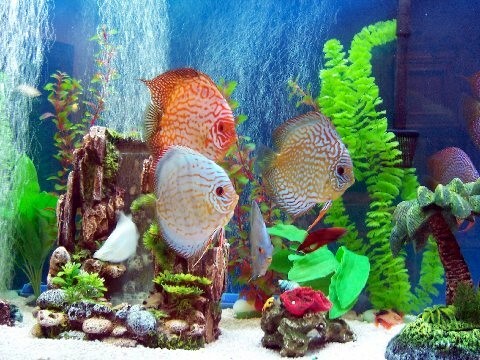 Discus can live until they are between 10 and 15 years old but it is not uncommon for those kept in well-run artificial habitats, to reach even older ages. Like many other fish, discus will eat almost anything that will fit in their mouths. Despite this, they have a predominately meat-based diet that is high in protein. They mainly feed on small fish and fry, along with larvae and other aquatic insects, and invertebrates such as worms. They tend to eat relatively slowly, grazing through the surrounding waters for tasty morsels. Those kept in captivity are also commonly fed brine shrimp and bloodworm which are both protein-rich, along with standard fish flakes (although this needs to be monitored to avoid over feeding). Discus inhabit areas where there is plenty of underwater debris for them to hide amongst. Their unique shape, colours and markings also provide them with camouflage from approaching predators in the Amazon river system. Larger species of fish, turtles and other water-dwelling animals are the most common predators of the discus, along with other predators such as bats and birds that hunt the discus from the sky above. Discus populations across South America are also threatened by habitat destruction, caused both by deforestation and pollution of the surrounding water. The discus today is an incredibly popular aquarium species and it is thought to be one of the most written about tropical fish, over a period of just 50 years. Although fish today are all thought to have come from the green, brown and blue discus in the wild, others colours are much more common in tanks including yellow, black and red. Today there is a major industry behind the captive breeding of discus, which primarily occurs in fish farms in a number of countries in Asia. They are relatively peaceful fish, co-inhabiting their surroundings with other, generally smaller fish that provide no competition for food. Today, the discus is listed as a Threatened species in it's natural habitat meaning that if the situation progresses unchanged, the discus will be at threat from extinction in the wild in the near future. Although many variations of discus occur in tanks around the world, population numbers of the original discus species in the wild are declining, primarily due to the decreasing quality of the surrounding water.